Hackathons are, by their very nature, punishing experiences. 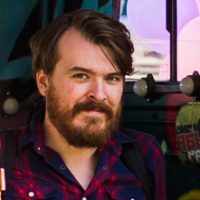 Ambitious developers sit at their laptops trying to build a brand new product for much longer than most sane people binge-watch Stranger Things. 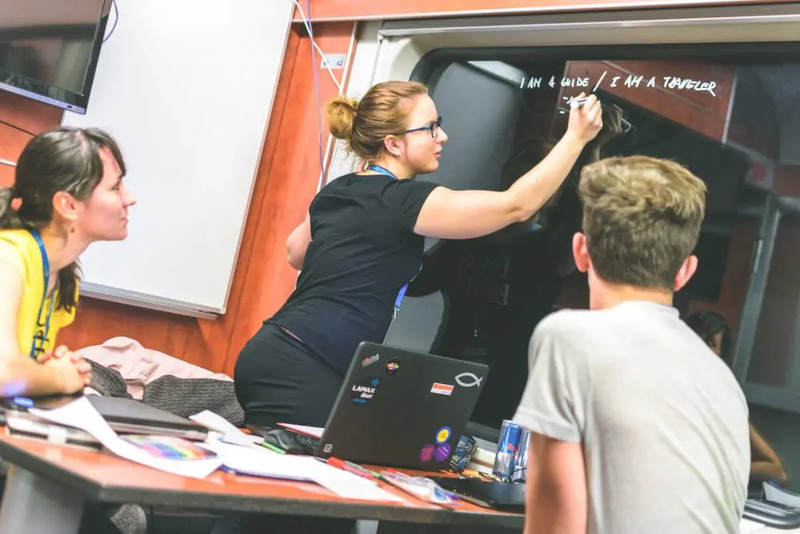 For their latest hackathon, code.kiwi.com decided to ramp up the pressure and held their 26-hour event on a train. The roar of the wind, the clatter of wheels, confined coupés and sudden lurches that could easily lead to typos in lines of code all combined to drain the hackers’ energy. 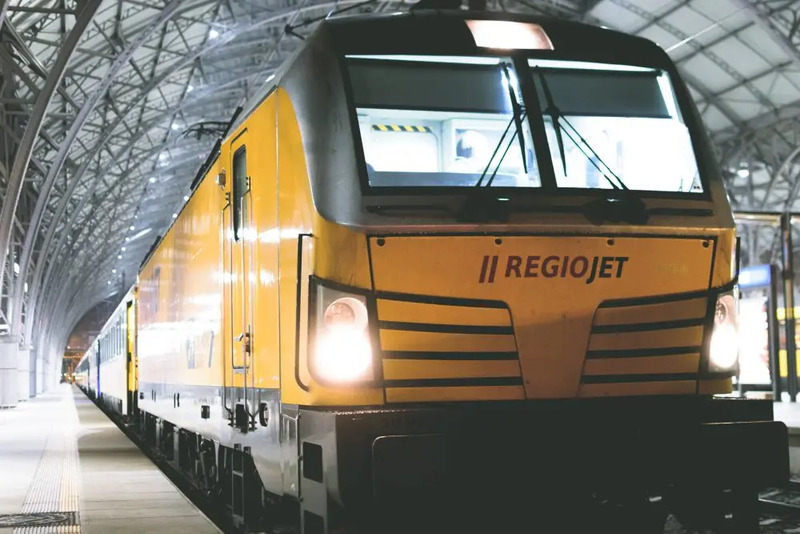 But, despite the difficulties, there were some excellent new products to display when the RegioJet train thundered home to Prague from its return trip to Košice. The winning team were Fly 2 Event, who developed a programme to create tailor-made travel packages according to what its user has liked on Facebook. They received a €2,500 ticket voucher, and are likely to take a holiday to Amsterdam. They were followed by Pickme Up, who created an app using a similar principle to find holiday destinations and experiences, and Hackiwi, which links the Kiwi.com mobile app to Instagram in order to provide travel recommendations. 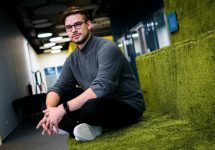 “We plan to sell not only travel tickets, but also tickets for events that will be recommended to users by the app,” says Pavlo Onysko of Fly 2. Surrounded by the grand murals of Prague Hlavní Nádraží’s Presidential Suite, the journey began with the formation of teams. Some, like Fly 2 Event, had arrived as a ready-made package and had travelled from as far as Kiev for the opportunity; others came along by themselves, hoping their skills and ideas would be a good fit with the other hopefuls. 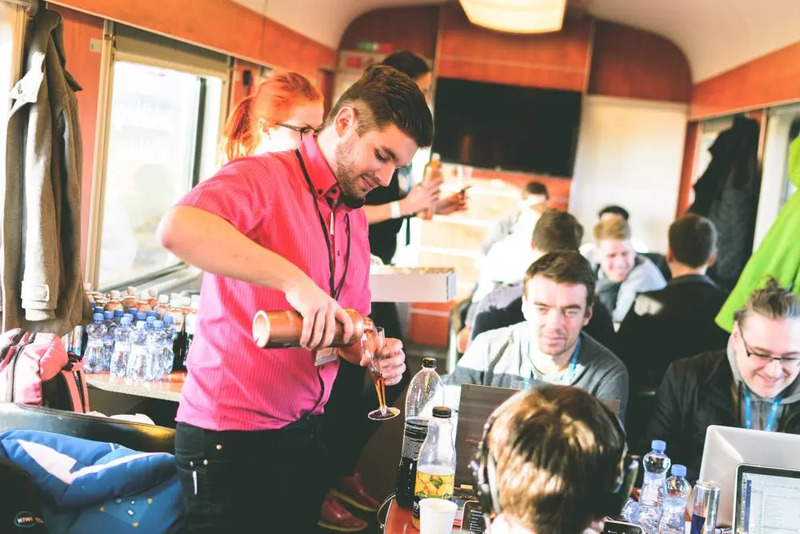 After a brief presentation of their ideas, the teams boarded the business-class carriages of the train and, fuelled by coffee, Red Bull, beer and vodka, got to grafting. While the train began to roll through the darkness, they scribbled their plans on the windows and began to code. 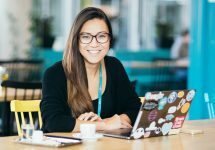 As technology has taken a significantly more important place in our lives over the past ten years, so has the demographics of those attending hackathons changed. Now, you’re as likely to meet businesspeople and marketers hunting for a killer app as you are to find someone who can make Ruby on Rails sing. This even extended to code.kiwi.com’s partners RegioJet, who provided the train to Košice. 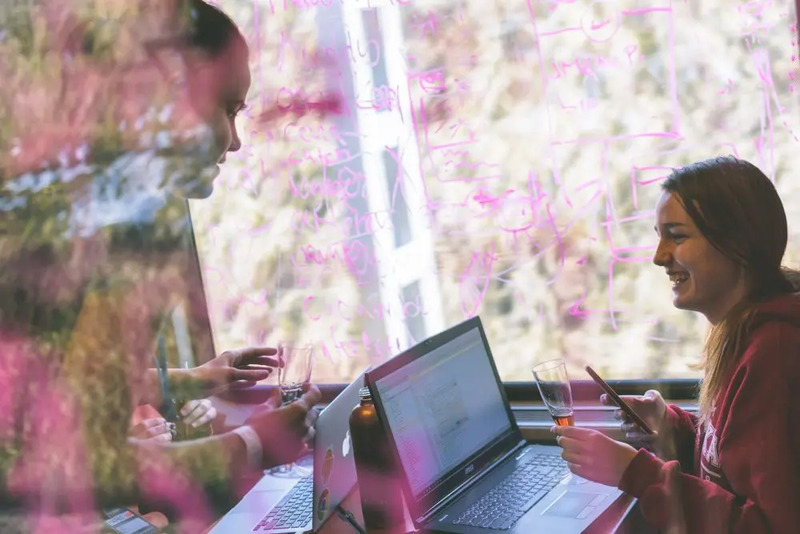 As a company looking to expand their online business, their Director of IT development, Jan Pavlovič, wanted to learn about how to execute a hackathon, and what benefits these can bring a company. Google’s Thorsten Koch and Brendan Hills provided support in using their Cloud as a platform on which the developers were building the apps. Senior developers from a range of Kiwi.com’s teams also provided the teams with mentorship. Kiwi.com’s mentors also hacked RegioJet’s onboard wi-fi to strengthen and extend the range so it was stable for all the competitors. 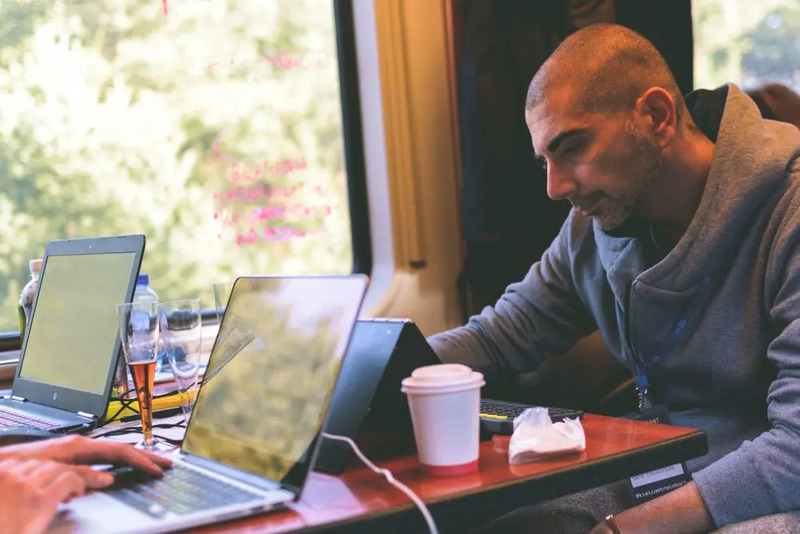 “We partnered with RegioJet and hosted our own wi-fi access points in the subnetwork of the train, we prepared a portable server where we hosted useful services for collaboration and preloaded it with resources for development,” said Bence Nagy, Platform Software Engineer at Kiwi.com. “In addition to providing a train, deploying special conference cars and refreshments and helping with organisation, we sent our Director of IT Development, Jan Pavlovič, as a mentor of the event who drew additional inspiration to develop new trends in the development of transport applications,” Žarnovický said. Košice is full of grand churches and palaces. However, as the train pulled to a halt it lay under a damp, freezing November fog. Not that the teams had an opportunity to explore the sights of Slovakia’s second city in the grey early morning light. There was just enough time for a quick walk to the centre after a train station breakfast and progress updates. By this time most teams were confident they could reel their projects in on time. Some had even taken a chance to sleep on the floor or in their seats. Working demos of augmented reality maps were being constructed, and Android apps were played with to see if they could do what they were supposed to. Again surrounded by the roar of the train pushing through the countryside, the teams were hard at work when the mist suddenly disappeared. Standing tall on the horizon were the great snow-covered Tatra Mountains. Tools were downed for a few minutes as everyone gathered by the note-covered windows for selfies and Tatratea, a Slovakian tea-based liqueur that certainly warms the bones. Across the border, and on the final run to Prague, the teams were given another opportunity to relax. Two masseuses boarded the carriages and kneaded the knots out of the tired muscles from everyone hunched over a computer. But by now, time was short and some coders felt they couldn’t even take a five minute break. People were beginning to worry that they had been overly ambitious. An odd mix of alcohol and caffeine-fuelled panic, calm and celebration settled over the train as darkness fell and the rush to finish the applications began. Teams started to exhaustively prepare their final presentation, rehearsing questions and staring at Powerpoints, some typed furiously on their keyboards, and others sat with a beer and attempted to break what they’d built. By arrival, most if not all, teams were satisfied they had done the best they could. The final presentations were made to RegioJet’s Pavlovič, Google’s Hills and Koch, and Kiwi.com’s team of mentors. 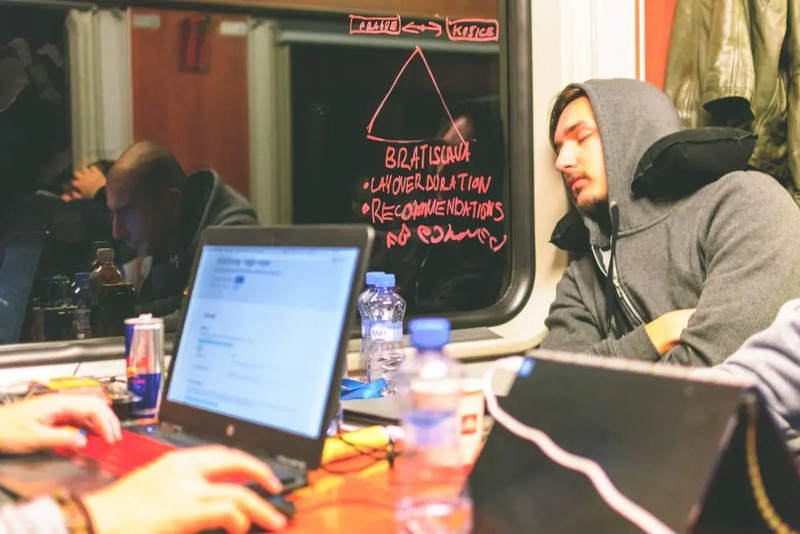 Somehow, even after 16 hours slog on the train, the teams managed to hold themselves together and sold their new products as best as they could. There was a huddle of judges to decide that Fly 2 Event would take the crown, and everyone decamped to party in a nearby pub.